This is the book that Ever should have been. I felt the connection between the couple in Meet Me at the River in a way I never did with Ever. It's really too bad that I rarely click with the books which have a certain sort of quiet beauty in the details. In the same way that I struggled with Shiver and A Certain Slant of Light, I did the same with Meet Me. I could see how others might connect with this melancholy account of a girl's day-to-day struggle to handle her loss of a dear love. THE WRITING IS SO DARN BEAUTIFUL, AFTER ALL. My attention span is that of a fly. If stuff isn't happening RIGHT NOW, my mind will wander. I'm envious of the people who can appreciate the journey more than I can. So, for that, I put my enjoyment rating at about a 2 star. But the end of the book was so damn beautiful and profound that I cried. I had to give an extra star for an ending which was impossible not to appreciate. Well done, Ms. de Gramont. You got my tears. 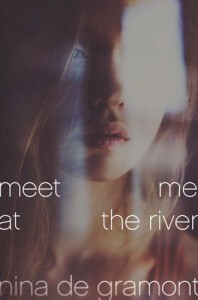 If you like the books I mentioned above, you'll probably enjoy Meet Me at the River far more than I did.